The following may make no sense—especially to those outside the Northwestern-centric bubble otherwise known as Evanston—but ever since I moved a few houses down from Chicken Shack, I’ve been eating more salad. No, it’s not a salad composed of a quarter chicken with fries and hot sauce. But it does come with a side of ranch. Yes, I’ll admit it. I go to Chicken Shack for the sole purpose of procuring ranch dressing for my salad. And let me be clear, the ranch at Chicken Shack is worth the 49 cents a side. It’s obviously made from high-quality dairy products—sour cream? Do I taste you in there?—and only the king of all ranch dressing mixes. * It’s worth the the two minute walk to Chicken Shack, to say the least, and it keeps me from dirtying a mixing bowl. Why, one might ask, do I not simply buy a bottle of ranch from the grocery store, instead of purchasing only two servings at a time, each requiring a trip to Chicken Shack? Because as odd as it sounds, the ranch dressing at Chicken Shack is fresh. Freshly stirred and free of that certain odd, shelf-life dairy preservative flavor most bottled creamy dressings have. But, the recipe below is not a recipe for homemade ranch dressing, or even walking directions to 1925 N. Ridge. Alas, after having visited Chicken Shack more over the past week than I have set foot in a grocery store only to buy ranch, it’s clear that I have a problem. And thus, I made my own salad dressing, which was not only easy, but it took just as long as a trip to Chicken Shack if you factor in assembly. To be real, I was getting tired of ranch dressing anyways. 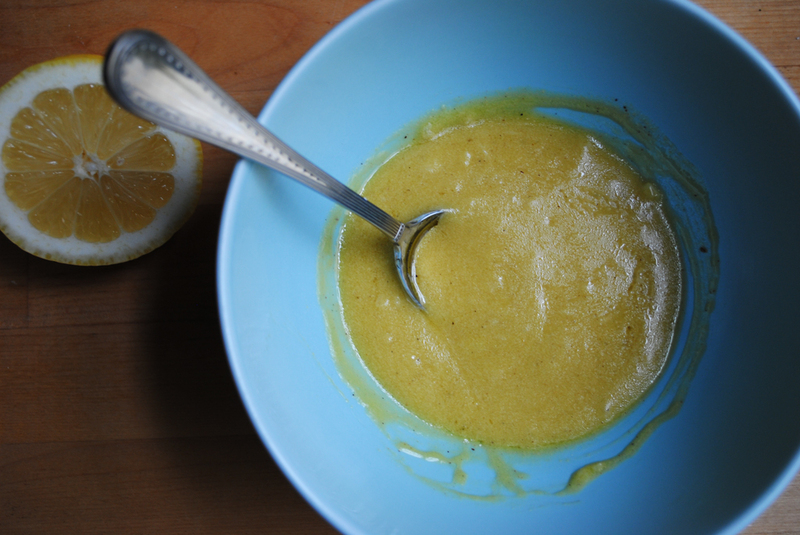 This Lemon Caesar dressing is a faux-Caesar, but it is no less delicious than the real thing, probably due to a healthy amount of parmesan cheese. An excellent salad dressing has just the right balance of acid to fat. This dressing takes it a bit further, throwing in a bit of Dijon mustard and lemon juice to counteract the richness of the olive oil. The result is a salad that truly needs no other complement (aside from perhaps a few homemade croutons, which, as it turns out, are really quite simple to make in your own kitchen). Again, just as easy as running to Chicken Shack. If you take the time, and time in this recipe really means less than 10 minutes, 5 if you’re speedy, you’ll have a salad dressing to keep forever in your repertoire. Homemade, and infinitely more delicious than anything 49 cents can buy. *Nope, not you sour cream. Even better. The all-important supreme ranch-dairy base, buttermilk. Way to go, Chicken Shack. I love you all the more. 1. 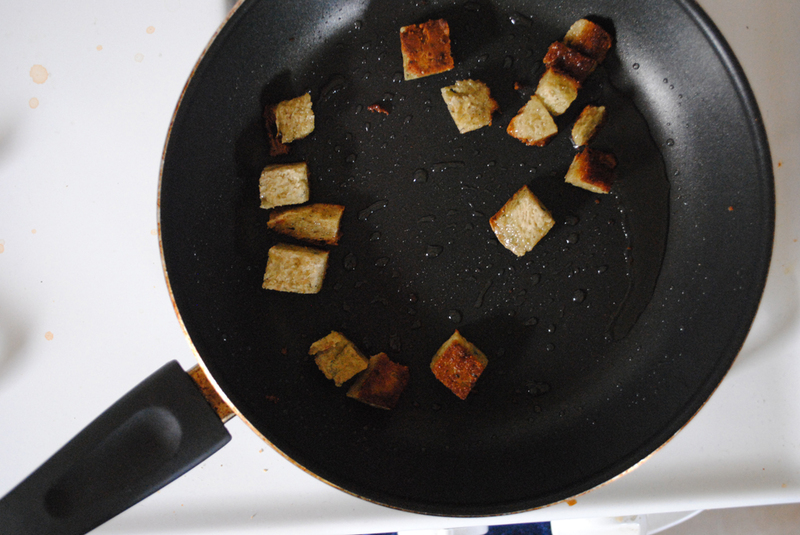 To make the croutons, add about a tablespoon of olive oil to a frying pan and heat over a medium flame. Tear or chop the stale bread into inch pieces and toss into the pan. 2. Toast until golden, tossing occasionally, about 3-4 minutes. Let cool on a paper towel, and toss lightly with salt. Store in an airtight container once cooled for future use. Note: If you want to make dressing for multiple salads, follow the proportions above and simply refrigerate the dressing in an airtight container as you would any store bought dressing. This salad dressing keeps for about a week, and the recipe makes more than enough for one or two salads of the suggested size. 1. 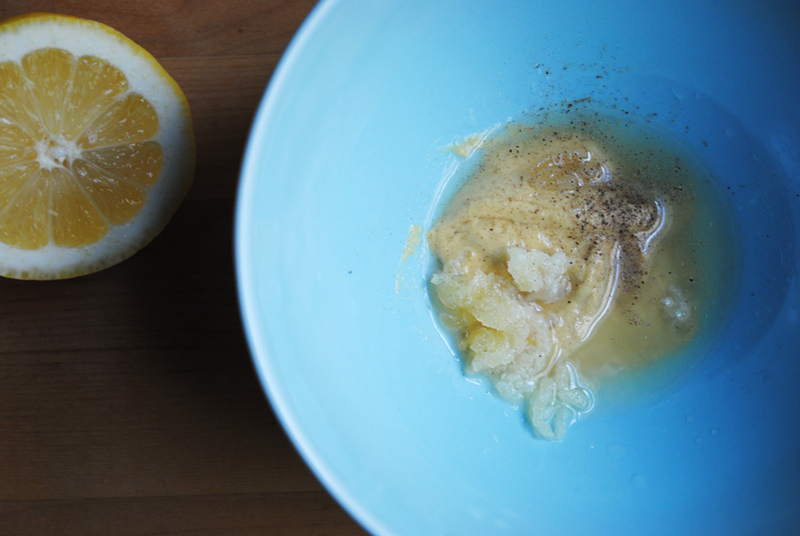 In a small bowl, combine the Dijon mustard, pressed garlic, lemon juice, and freshly cracked pepper. 2. While stirring continuously, drizzle the olive oil in until the dressing is emulsified and is tasty, about 3-4 tablespoons of oil. 3. Add more pepper, and a bit of salt if desired. Don’t worry if the dressing breaks (oil separates.) Simply whisk it back together and add a dash more mustard or lemon juice however, chances are no one will notice a broken dressing. Store leftover dressing in an airtight container in the refrigerator for future use. Note: An easy and quick way to dress a salad without tossing is to combine all your components in a big Tupperware, seal it, and then give is a good healthy shake. Voila! Tossed salad. 1. Wash and dry the lettuce, removing any unsightly leaves. If you are sans a salad spinner, as most college kitchens are, pat each lettuce leaf dry with a paper towel and then let air-dry while you assemble the rest of the salad. 2. Once the leaves are dry, chop off ½ inch of the bottom white rib and discard. 3. Chop the rest of the leaves up into pieces about an inch wide, split the leaves in half lengthwise to create a salad with uniform leaf size and texture. 4. 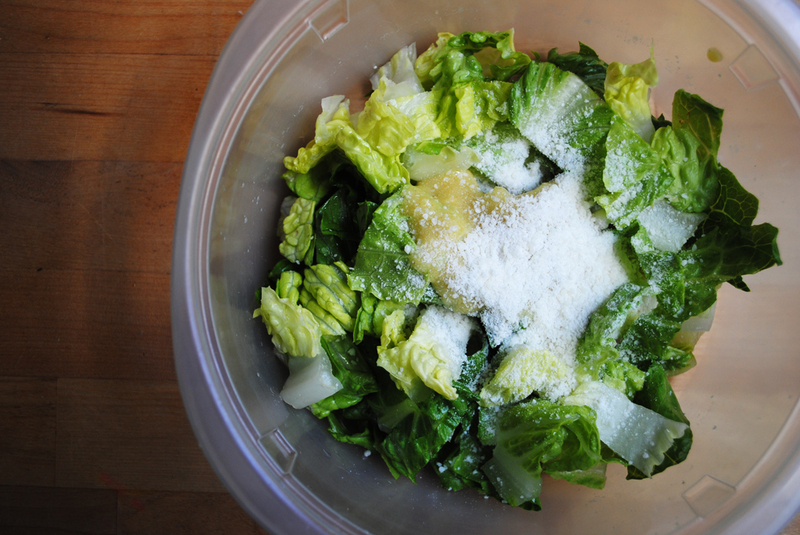 Toss the salad with half of the dressing and ¼ cup of the grated parmesan cheese. Add more dressing and croutons, if desired. Top the salad with an additional sprinkle of cheese and freshly cracked black pepper. Eat immediately.